Arresting proposition: This Commodore-based concept police patrol car in Los Angeles Police Department livery might pave the way for a return to US exports for Holden. UP TO 40,000 Chevrolet-badged Commodore police vehicles could be exported to the US annually in a deal that would eclipse GM Holden’s current North American export program, which was axed along with the Pontiac brand by General Motors last night. GoAuto has learned that a plan to supply hi-tech Australian-made patrol cars to US law enforcement agencies – led by the Los Angeles Police Department (LAPD) – could be joined by lucrative police vehicle exports to Canada, the UK and the Middle East. And while the prospects of reviving plans to sell the Holden Ute in the US as a GMC continue to exist, it is understood the now-defunct Commodore-based Pontiac G8 has a good chance of morphing into a full-time Chevrolet model for US public consumption. In an ironic twist, if green-lighted, the police project could see Holden’s Commodore effectively replace Ford’s aged Crown Victoria as the vehicle of choice for many US police departments, which require large, V8-powered rear-drive sedans. The Crown Victoria, which was discontinued from public sale in 2008 and will be phased out of production for US fleet customers next year, has long been touted as Ford Australia’s most obvious US export opportunity for the Falcon. Some US police departments have already adopted Dodge’s new Charger, but the Crown Victoria still attracts 60,000 annual sales for Ford, representing a potentially massive export opportunity for Holden. Officially, Holden remains cautious about spruiking the prospects of sending Commodores to the US as part of a police vehicle export program, but national media relations manager Scott Whiffin admitted to GoAuto this week that a Pontiac G8-based LAPD prototype produced by Port Melbourne-based National Safety Agency (NSA) has “enormous” potential. “That’s certainly something that is being looked at very closely,” Mr Whiffin revealed. “We are looking at all opportunities. “Holden has a really good reputation for seeking out opportunities in the marketplace and benefiting from them, and our work starts now in terms of finding new opportunities for this vehicle. NSA operations director Des Bahr, who will next week present his company’s LAPD Prototype Vehicle concept to the Royal Canadian Mounted Police, was more forthcoming about the project, which has also received interest from law enforcement groups in the UK, Middle East and Asia. The left-hand drive Pontiac police car, which was jointly developed by the NSA and the LAPD – which is believed to be highly enthusiastic about the project – was launched by the LAPD’s deputy chief Charles Beck at the 2009 APCO Australasia Conference & Exhibition, held at the Australian Technology Park in Sydney over March 2-4. Mr Bahr said his company was in talks with nine separate US law enforcement jurisdictions, which together represent a fleet of up to 40,000 vehicles a year. “The potential is enormous, given that we’ve got nine jurisdictions interested and even that alone is tens of thousands of cars,” Mr Bahr told GoAuto this week. “They are interested in the project to determine whether this, which could be deemed as a replacement for the Crown Victoria, is suitable for their environment. “We’re talking in the vicinity of 30,000 to 40,000 cars annually or at least every couple of years based on the kilometres they do. Mr Bahr said interest in the vehicle had also come from the Middle East as late as last week. “That’s in the early stages of understanding what we’re doing with the project to determine whether the Asia region could piggyback off that as well, so there’s literally huge potential,” he said. Mr Bahr said two examples of the LAPD Pontiac G8 would be sent to the US for testing by mid-year. Mr Bahr said that while he was awaiting official confirmation from Holden in relation to how the project could be affected by GM’s latest restructuring announcement, the LAPD project vehicle’s presentation to law enforcement groups globally would not be affected. “This is an NSA project,” he said. “We’ve just chosen the GM platform to display what we’re producing at our end, so there are a couple of components: the car itself as a patrol vehicle and an extension of that is the integrated technology that we’re proposing to put into the vehicle. “We’ve chosen the G8 platform on which to build the vehicle given that a lot of the earlier research was done on the Commodore platform. He said the vehicle could be modified locally by Australian suppliers for export as a turn-key product. me either, stay tuned for rest of story. Guess we will know more next month? I love my 4 door Vette! Well this means we'd be able to get parts! “We have arrangements with other organisations that do (have the ability to series produce the LAPD prototype), but our involvement would be for the installation and fit-out of what we call the turn-key technology for that vehicle,” said Mr Bahr. “At this stage it’s a concept to be sent to the US for acceptance or otherwise for suitability, but we have been working with LAPD for the last few years, sharing information on the research we have been doing. So it’s about adopting integrated solutions that they’re already familiar with on a new platform. GoAuto understands that if a deal is struck with the LAPD, which is regarded within Holden as a test-case for other US police jurisdictions, the LAPD vehicle would most likely be badged as a Chevrolet – not a Pontiac. In turn, it is understood that could lead to retail exports to the US of the Commodore, which finally appears to have gained ‘traction’ in the US market despite a recent lack of promotion and could be sold as a performance model within the Chevrolet Performance Division, which is the US equivalent of HSV. When asked whether GM would shift any of Pontiac's models to other brands, GM CEO Fritz Henderson said: "Solstice... no. Vibe we're talking with Toyota about and may run it into the 2010 model year as one of the last Pontiacs remaining." But he made no reference to the G8. Holden already exports a left-hand drive Chevrolet-badged Commodore to the Middle East - and South Africa - as the Lumina, which means the basic modifications needed to prepare the car for sale as a Chevy in the US have already been done. Holden has also exported a police car based on the previous-generation platform architecture to the Middle East, New Zealand and elsewhere. If approved for export, the Chev-badged Commodore could be positioned above the Barina-based Chev Aveo and the mid-sized Malibu, and sold either alongside or instead of the full-size front-drive Impala sedan, which is due to be replaced in 2012. Mr Whiffin said Monday night’s announcement, which confirmed the phase-out of the G8 by the end of 2009 even though production has effectively already ceased, was a major blow for Holden. The move to axe GM's 83-year-old Pontiac brand, as part of the former world number one auto-maker's second viability plan for US treasury, spells the loss of nearly $1 billion in potential exports for Holden, which invested $77 million in the G8 program. “What came out overnight was that GM intends to eliminate Pontiac from its portfolio by the end of 2010 to concentrate on its four key brands: Chevrolet, Buick, Cadillac and GMC,” he said this week. “GM are obviously not denying that fact they’ve had to make some tough decisions in terms of planning during the global economic crisis and clearly this is one of those tough decisions. “The impact for us is on the Pontiac G8 export program, so what we intend to do in a practical sense is to work with Pontiac to manage that as we move forward. “The announcement just happened in the last 12 hours or so, so we’re still trying to get our arms around the specifics of it, but it’s a process that we’ll work through with them. “In terms of the emotion of it I guess it would be pretty hard to deny the fact that we’re disappointed. The G8 program was a ripper. It was a great car, it was exceptionally well received and it got some fantastic reviews in the States. “But while we’re disappointed we fully understand the rationale for the decision,” he said. Ironically, this week’s axing of the Pontiac brand and by extension the G8 sedan follows the best month of sales recorded by the Australian-built model since it was launched in the US in March 2008. Pontiac sold 15,002 examples of the G8 in the US last year, averaging 1455 sales a month, but in February this year sales surged to 2707 - the first time sales exceeded Holden’s forecast of 2500 monthly sales. Some 2939 were sold in March, making it the best sales month so far for the G8, when it out-sold the mid-size G6 to be Pontiac's best-selling retail model. However, in an indication of how many G8s are still residing in US showrooms and shipping yards, Holden said it shipped almost double that number of G8s during 2008 – about 36,500. Mr Whiffin confirmed Pontiac production had virtually been halted at Holden’s Elizabeth plant in South Australia by January, following a general slump in US in the final quarter of 2008. “It’s was going gangbusters for the first three quarters of last year, then along with everything else fell off a cliff in the last quarter of 2008 when the global economic crisis really hit hard,” he said. “The US market basically halved as the global economic crisis hit in the last quarter of last year. We saw those numbers really coming off very quickly and we moved last year to align production volumes with demand so we weren’t really being caught totally by surprise by this. Mr Whiffin said the Pontiac announcement would have no effect on Holden’s workforce because the restructuring announcement it made earlier this month had already taken into account a virtual idling of G8 production. Holden will cut one of its two manufacturing shifts at Elizabeth from May, with the company’s 3150 production workers offered a choice of one-week-on, one-week-off or fortnight-on, fortnight-off shifts in an effort to avoid retrenchments as Holden cuts production to 310 vehicles a day – about half of its normal two-shift capacity of 620. “In terms of jobs, despite the fact we’ve only known about this for half a day, we don’t think there will be any job losses over there at all,” said Mr Whiffin. “With the production volumes and production scheduling at Elizabeth, we’ve spent a lot of time, blood, sweat and tears trying to align that with demand and it’s been exceptionally difficult on our suppliers and our workforce over there. “The approach that’s been taken thus far has been a month-by-month process. We forecast a month ahead and then we try and align that with what’s happening in the market and it’s been very ad-hoc. “There have been a significant number of down days but we’ve only been able to forecast them a month in advance which makes it incredibly difficult for our suppliers to align with that and incredibly difficult for our own people trying to live a normal life when they might be working a week and they might be off for 10 days then back for a fortnight. “It’s impossible to live your life like that because you can’t really, for example, organise childcare, take a second job or take a holiday with your family because shifts have been all over the place. “So what we announced a fortnight ago was that we would move from a two-shift two-crew operation to a two-crew one-shift operation and that’s really about bringing continuity into the production schedule over there so that people can build their lives around that,” he said. Mr Whiffin said he was not aware of any further white-collar job cuts in either design or engineering that could stem from the Pontiac announcement. The G8 was the first full-sized Pontiac since the 2005 Bonneville and the 2006 Monaro-based GTO. It was shortlisted for the 2009 North American Car of the Year award but lost to the Hyundai Genesis, which has also failed to sell in expected numbers, despite being billed by some as comparable to four-door sedans from BMW and Mercedes despite being vastly less expensive. Recent market prices have been up to $7000 lower than Pontiac’s official G8 price. The G8 is available in the US with a 191kW 3.6-litre V8 similar to the Alloytec V6 that powers Australia’s Commodore, mated to a five-speed automatic transmission. Next year, it was due to be replaced by a direct-injection version, which offers about 220kW and is similar to the V6 found in the Cadillac CTS and the entry-level version of the Holden-engineered Chevrolet Camaro coupe, which is based on the VE Commodore’s global rear-drive Zeta chassis architecture. The Pontiac G8 ST came with a 269kW 6.0-litre Gen IV V8 with Active Fuel Management (AFM) and a six-speed automatic transmission, while the range-topping G8 GXP packed a 309kW 6.2-litre V8 similar to that used by HSV and the Chevrolet Corvette. It was the only G8 also available with a six-speed manual gearbox. Holden’s four-door Crewman utility made an appearance as the GMC Denali concept vehicle but its two-door Holden Ute sibling was launched by Pontiac alongside the GXP at the New York motor show in March 2008. 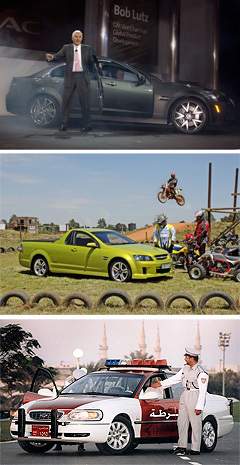 Powered by a 220kW V6 and 269kW V8, the so-called G8 ST (for Sport Truck) Holden Ute would have been Pontiac’s first pick-up truck. The NSA is a not-for-profit advanced technology research organisation that aims to deliver real-time decision-support tools via integrated information and communication technology (ICT) systems to various platforms in the international public safety, security and emergency services sector. Its vision is to deliver practical solutions that can be rapidly deployed in the field to enhance decision making, increase personnel safety and simplify knowledge transfer. Billed as the most technologically advanced police car in the world, the Commodore-based LAPD patrol car was built as a test-bed to trial the latest technology in the vehicle environment. It is claimed to turn a standard vehicle into a ‘virtual office’ for emergency services personnel. Much of the technology incorporated into the vehicle was showcased in the Emergency Service Concept Vehicle (ESCV) the NSA revealed in December 2007, including automatic number plate recognition (ANPR), remote WAN and database access, vehicle telematics/diagnostics, mobile automatic fingerprint (incorporated into a PDA) and facial recognition units, officer safety cameras and HAZMAT/building information. The ESCV began as an offshoot of the Standardised Approach For Emergency (SAFE) vehicles project, which was commissioned by the NSA in conjunction with the Victorian Partnership for Advanced Computing (VPAC), GM Holden and AutoCRC, with research from the Monash University Accident Research Centre (MUARC) and the Monash University Department of Engineering (MUDE). According to NSA, the purpose of the Commodore SV6-based SAFE, which was produced with assistance from suppliers including Motorola and Hazard Systems, was to understand emergency driver user-interface requirements and safety issues, and to develop a standardised interface platform that addresses ergonomic design and safety. Trials held in LA showed that a vehicle fitted with ANPR could scan between 5000 and 8000 vehicles in a 10-hour session, the data from which is related to officers via a laptop notebook. In addition, features such as a duress button allows for back-up to be called more quickly than via radio, while in-car cameras provide real-time back-to-base video of offenders for use in court of for training. Another trial in LA showed the facial recognition function was able to identify gang members, allowing field officers to identify suspects without bringing them back to the station. Manufacture has to supply parts for 7-10 years after last production I believe. You're correct, but if they come here as police cars parts will be ALOT easier to get! Yes, G8-5150, it does. This confirms a 6 month old rumor. 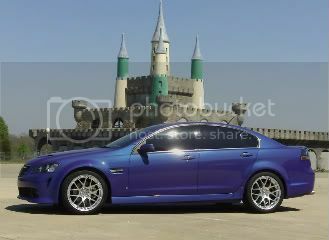 So lets flood GM with requests for this car to be sold as the NEW Impala and Impala SS with available LS3 and M6 ! More options would be nice too , Memory seats , glove box light , nav system , better interior surface quality and more gauges in the dash where the Atari gauges were in 08. 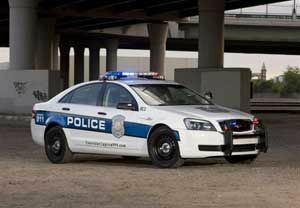 Related Article: IACP Products: Chevy Caprice police car will be on duty in 2011 Even as a new officer, I didn’t have the car long before I was given an opportunity to drive various other models, most not worth mentioning. A few years later I received a car that many have called one of the greatest ever made for police service — a 1995 Chevrolet Caprice 9C1. Been in police work 30 years. Love to have one of these in the driveway next to the G-8! Hope for a Chevy badged Holden rear drive V8. I heard the Cup car was going to be based on this platform so this could be good news!! I have pictures of a Caprice "Police Demonstrator" at a local Chevy Dealer. Is any of this "new" news? Rick Kranz is product editor for Automotive News. There's a lot of buzz surrounding Chevy's mysterious new model. I'm betting it's the vehicle former GM product czar Bob Lutz talked about a few years ago. Earlier this week, Chevy announced that the brand's NASCAR teams will be racing a vehicle that carries a new nameplate. "Impala" is being abandoned at the end of the NASCAR season for a new nameplate. This is not something that would normally peak my interest. But what caught the attention of occasional NASCAR followers like myself was the announcement the race car will closely resemble the production version. Closely resemble the production version? That's news, and Chevy says it won't be carrying Malibu, let alone Spark or Sonic badging. It will be a new nameplate. Chevy won't say if one of the nameplates in its rich heritage will be revived. During a conversation with Lutz a few years ago, he mentioned that Chevrolet needed a rear-wheel drive performance sedan to draw buyers to the brand. At that time Lutz was vice chairman for product development at General Motors. He described a kind of spiritual successor to the 1994-1996 Impala SS. That car was distinguished by the Corvette V-8 under the hood. Jim Perkins, former head of Chevrolet, gets credit for the car, a car that's held in high regard today by collectors. Lutz said the new generation Impala SS would be developed by Holden down in Australia on the subsidiary's rear-wheel drive architecture. Pontiac got a version called the G8 GTP, back in 2009, which packed a 402-hp 6.2-liter V-8. Chevy didn't. Blame GM's bankruptcy. Last year, Chevy teased enthusiasts with the Caprice, a V-8-powered sedan from Holden that's available to law enforcement agencies. Chevy enthusiasts pined and speculated about a U.S. civilian version of the Caprice. Some time in the next several months Chevrolet will disclose the new nameplate, unveil the production car and the racing version for NASCAR tracks. We will see just how close in terms of styling the race car is to the production version. NASCAR dictates the shape of today's stock cars, meaning what essentially distinguishes a Chevrolet, Dodge, Ford or Toyota on the track are the car's color and graphics, and the brand's name positioned on the vehicle. Every race car body is essentially the same shape, probably coming from the same mold. While the graphics say Impala, Charger, Fusion and Camry, the car bodies lack the distinctive shape of the retail units. One body fits all in NASCAR -- that's essentially the rule. It's pretty boring. But NASCAR changed the rules for the 2013 season. Automakers can incorporate a few styling cues seen on the retail car. Charger, Fusion and Toyota versions have been unveiled, and, yes, there's a closer resemblance to the retail versions. NASCAR enthusiasts can feel like they are closer to driving their favorite driver's racing machine. But I think Chevy trumped each by adopting a new nameplate, separating this new performance car from its mainstream models. The strategy will create a buzz for the brand, drawing consumers to showroom to see Chevy's hot new car, which just might translate into sales for those other models in the product line. You can reach Rick Kranz at [email protected]. I wonder if they will call it Commodore? I've heard it will probably be priced at the Charger SRT8 level. It is supposed to be very limited in supply too. Very exciting news! I just hope Chevy continues to make it every year because it is going to be awhile before I can buy one. 2014 Chevy SS is confirmed for public and NASCAR 2013. VF Commodore V8... details unknown.